AMD FirePro™ W8000 is the high-end category leader for multitasking and application performance across up to four displays. It's up to 4.5 times faster than the competing solution in single precision compute performance due in part to its innovative all-new Graphics Core Next (GCN) architecture. For 3D workloads, its GeometryBoost feature makes quick work of triangles, processing 1.8 billion per second, up to 1.5 times more than the competing product. 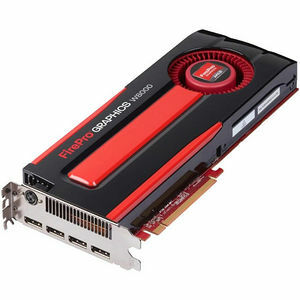 Equipped with a large 4GB GDDR5 frame buffer, W8000 delivers up to 1.5 times more memory bandwidth than the competing solution, and with high performance computing (HPC) features like error correcting code (ECC) memory and 806 GFLOPs of double precision floating point performance, it's a great choice for HPC workflows.